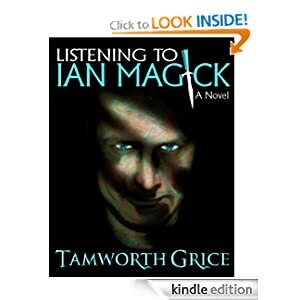 My first review for the blog’s new feature, Indie Book Reviews is Listening to Ian Magick by Tamworth Grice. This review comes easily, as I’d already read the novel and had even posted a review to Amazon. I didn’t think this book was for me. It’s not the type of thing I usually read–high school, teenage angst and all that. But the premise about a Satanic rock star potentially possessing people and sending kill messages through his music was enough for me to at least take a look. I must say, I was pleasantly surprised! Listening to Ian Magick hooked me from page one and kept me reading all the way through to the VERY thrilling, nail-biting conclusion. A great story is told here by a fresh young voice in modern horror. Dark things are happening in the little town of Horrify, and it will keep you guessing until the very end. Really, I hope there’s a sequel on the way because I believe the stage has been set for more good things to come. The characters were real and intriguing and I would love to discover more about each of them through more adventures in the future. Listening to Ian Magick is a smooth easy read and will keep you engaged and turning the pages. When I reviewed this for Amazon I was torn between 4 stars or 5 stars. The reason I was considering 4 is because of personal taste (as I said above, not the type of book I normally read). I eventually settled on 5 stars for Amazon because I think it deserves it. When I rated it on Goodreads, I suppose I opted for 4 stars because of that whole personal taste thing. I know this seems confusing, so I’ll just end this review and, for the sake of the blog, split the difference to 4.5/5 stars! Check it out! I’m starting a new feature on my (also new) blog. I’ve decided that I will be periodically reviewing the written works of indie authors. I’ll first post the reviews here, but will also be posting them to Amazon and Goodreads as well. Here’s how this decision came about: I recently started purchasing and reading some indie author’s books. I did that for a few reasons. First off, I believe wholeheartedly in supporting indie authors. And since I may very well be a self-published ‘indie’ author sometime in the future, I thought it was a good idea to see what others were writing. I quickly discovered that this is also an excellent way to discover some great talent and find wonderful new books to read. Since I’m already purchasing and reading these, I thought it only makes sense to start reviewing them as well. And further, why not post them to my blog? That’s one of the things these blogs are for, right? Keep in mind, I am a very slow reader (a woeful curse as a writer) and there is an entire world of books out there for me to explore, so these reviews might be charging toward you at the pace of a snail in a snow storm, but I’ll get them posted as fast as I’m able. Also, if you (you reading this thing, not the creepy guy standing behind you) happen to be an indie author and you’ve written something you think I might be interested in (I’m a fan of horror, sci-fi and fantasy, and things that are overall dark, disturbing, or just plain weird) let me know. You can leave a comment here or anywhere else on the blog, contact me through my website, my twitter, or even join me over on Goodreads (here you can get a better idea of the things I’ve already read and liked). I’m extremely approachable. I’d also like to say that I’m not looking for ‘free’ review copies of anyone’s book. If you have something you think I’d like, talk to me here or at any of the social networks I’ve linked and let me know about it. If I’m interested, I’ll check it out. If it looks like something I’d enjoy, and the price is reasonable (which since most self-published author’s books are .99 to 2.99, that’s really not an issue) then I’ll buy it. I believe that if it’s worth my time reading, then it’s easily worth my few cents or bucks for a purchase. Another big reason for doing that is since I’m actually buying the books as opposed to receiving them as review copies, I’m under no obligation to write or post a review. Therefore, if I think it happens to be a stinking pile of you-know-what, I don’t have to (and probably won’t) review it. This is for your sake and mine. You save face and I don’t have to be a bad guy (I hate being the bad guy, really I’m too nice for that!). I can just keep my big Steven-Tyler-like mouth shut and move along to another book. Well that’s it for the introduction. The first review will be posted shortly, as I’ve already read the book and have even written a review for it on Amazon. I just have to clean it up, add a bit to it, and you’ll see it here soon. Until then, take care and happy reading/writing.